As Sydney turns up its postcard weather, the call of the beer garden is as hard to ignore as tinnitus. And no wonder. Huddling with your good pals on communal tables of lumber as you down frosty jugs and summery wines in the greenery shade is an easy way to live. Thankfully, from Song Hotel’s CBD and Redfern locations, you’re in the thick of a string of beery oases of all shapes, sizes and vibes. Here is a selection of five from the many alluring options. It’s true that the sandstone archway entrance at SILY has the vibe of a correctional institution but don’t be fooled – this den is a place of escape rather than to. 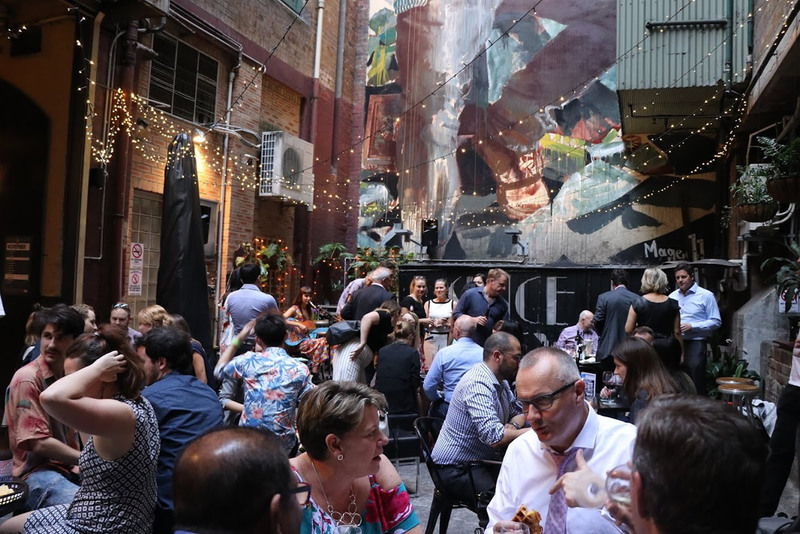 The beer garden, the centrepiece, is hemmed by the backs of leathery buildings made extra warty by exposed piping and roofed by a sky you’ll need tilt your neck hard to find. Claim a rickety-looking chair and table amongst the building-sized artwork, hydrated pot plants and strung-up pixie light webbing as you eye a menu populace with bar food hits such as cheeseburger toasties and banoffee waffles, and lights-on cocktails including Big Daddy Canes and Pisco Fevers. The beer garden also doubles as a compact entertainment space where DJs and bands/artists plug in on the garden stage, trivia masters stage quizzes and the specials hours are various and themed. Anyway you look at it, the view of the harbour from the Manly Wharf Hotel’s waterside beer garden is a vision. But as the sun starts to sink on the evening, it’s the perfect time to snaffle a table and down a bucket of tiger prawns as you marvel at the seagulls and boats bobbing on the water. 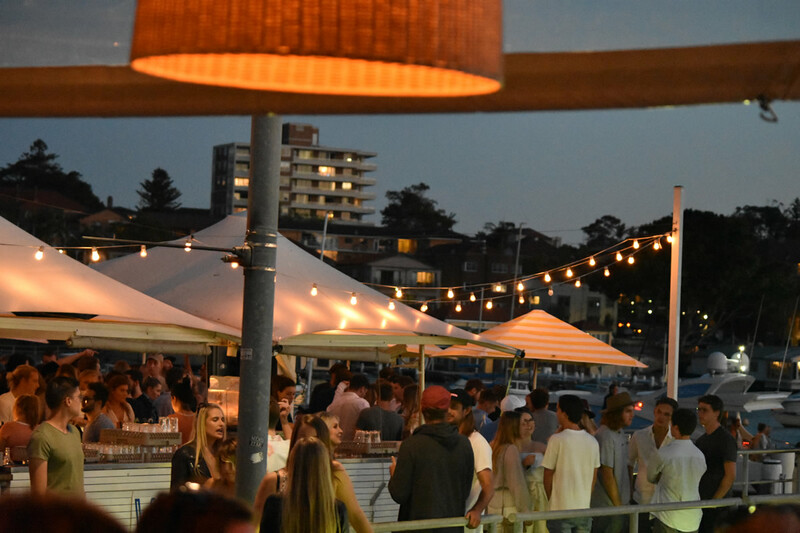 Live DJs and acoustic acts help bring the Manly Wharf Hotel to life and the beachy vibe has a way of goading you into extended sessions that are always perfect for Summer Garden Mojitos. The down-to-earth facade of this classic 20th century everyperson pub in Newtown would be inconspicuous on the main drag of your average Australian country town. It reflects truly on the endearing no-fuss vibe on the inside too. The beer garden, one of a quaint mix of rooms and warrens segmenting the venue, is a sprawling space of picnic-style benches, healthy foliage and umbrella shades that the eclectic mix of patrons are known to flock to pretty fast to enjoy reliable pub fare and an honest variety of tap beers, cider and wine. Formerly the location for the ABC’s Love Is a Four-Letter Word, if you get up for the bathroom and take to the wanders, you’ll find a very televisual larrikin spirit all around the Courthouse. Pinnies, arcade games, pool tables, sports TV and some of the dustiest-looking true-blue decoration going means finding fun is easy. At the Oaks Hotel beer garden, the action happens under a 70-year-old oak tree that would be the envy of any backyard. Beneath this stately behemoth (it gives the venue its name), you can enjoy the shade and the sun as you study a War and a Peace-sized menu that’s full of choices about spritely cocktails, storied wines and craft beers. If you’re feeling carnivorous, the good news is that the Oaks Hotel keeps an in-house butcher (not on a leash) and trades in a steak, “the Tomahawk”, that’s known to fall the biggest meat-loving egos. The Oaks Hotel’s history starts in 1885 but it’s had enough wardrobe changes, Botox and reconstruction in the last 132 years to look absolutely smashing for its age. It might be a hipster haunt but not for the wrong reasons. Indeed, the reason the Norfolk Hotel is known to endear itself to sleeve-tatted beards is the same reason it attracts everyone from old sports bar guys with cobwebs in their ears to mums to everyday friends bent on a table, a jug and a yak – it’s an inclusive venue that feels more akin to a lounge room than a tightrope. The mismatched furniture and wonky lay out in the beer garden sets a devil-may-care tone that’s spot on when you find yourself looking for somewhere to let it all hang out. A beer can festival, near-free nacho hours, bar crawls, trivia nights and discount wines are just some of the many goings-ons that make the Norfolk’s beer garden a drawcard.